Researchers created a rocket engine injector using 3D printing. It blazed to life during a hot-fire test on Aug. 22, 2013, at NASA's Marshall Space Flight Center (MSFC) in Huntsville Ala.
NASA's first attempt at using 3D-printed parts for rocket engines has passed its biggest, and hottest, test yet. The largest 3D-printed rocket part built to date, a rocket engine injector, survived a major hot-fire test. The injector generated 10 times more thrust than any injector made by 3D printing before, the space agency announced. 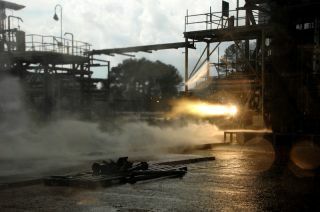 A NASA video of the 3D-printed rocket part test shows the engine blazing to life at the agency's Marshall Space Flight Center (MSFC) in Huntsville Ala. Propulsion systems engineer Greg Barnett prepares a rocket injector for a hot fire test at NASA's Marshall Space Flight Center. Injectors channel and mix the propellants that engines need to power rockets into space. During the firing test on Aug. 22, liquid oxygen and gaseous hydrogen passed through the 3D-printed injector into a combustion chamber, generating 20,000 pounds of thrust, NASA officials said. To make the injector, researchers used a process known as selective laser melting to fuse together layers of nickel-chromium alloy powder. Though the subscale test part was the size of an injector that might be used in a small rocket engine, its design was similar to an injector for a large rocket engine, like the RS-25 engine that will power NASA's Space Launch System (SLS), which is intended to for future deep space missions. "This entire effort helped us learn what it takes to build larger 3D parts — from design, to manufacturing, to testing," Greg Barnett, lead engineer for the project, said in a statement. "This technology can be applied to any of SLS's engines, or to rocket components being built by private industry." Early data indicate that the injector worked "flawlessly," NASA officials said. Further computer scans and other inspections are planned to look more closely at how the engine part handled the firing and how it compares with a more traditionally fabricated injector. 3D printing can reduce the number of parts (and thus the cost) needed to build a rocket engine. The injector in this test, for example, was made in two parts, while a similar injector from earlier tests had 115 parts, NASA officials said. NASA owns the injector design but the Austin-based company Directed Manufacturing created the rocket part. NASA says it will make the test and materials data openly available to American companies through its Materials and Processes Information System database. Beyond making rocket parts, NASA has been exploring a wide variety of uses for 3D printer technology in space travel, from cooking pizza for astronauts to building a lunar base. A California-based company, Made in Space, has been working with NASA to develop and test a 3D printer bound for the International Space Station, where crews on the orbiting outpost will be able to print their own tools and spare parts. The project, which recently passed a major design review, is tentatively scheduled for an August 2014 launch.